The thrill of racing down a steep alpine incline on a pair of skis may sound exhilarating to some, but rest assured there are plenty of options for those less in love with velocity. Cross-country skiing, invented thousands of years ago in Scandinavia as a way to cross terrain covered in snow, is still practiced today with varying degrees of intensity. In this form it’s the skier, not gravity, that’s calling the shots on speed. Whether you’re racing competitively or embarking on a meandering afternoon ski, no Alaska winter is complete without taking part in one of our favorite pastimes! Nearly any trail maintained for running and biking in the summer is prime for cross-country skiing in the winter. A few of our favorites are Kincaid Park and the Coastal Trail in Anchorage, Birch Hill Trails in Fairbanks and Bear Lake Winter Trail on the Kenai Peninsula near Seward. Kincaid Park and the Coastal Trail are some of the most popular trails in Alaska’s biggest city and skiers have the chance to see all sorts of wildlife, stunning coastal views and maybe even a glimpse of Mount Denali. 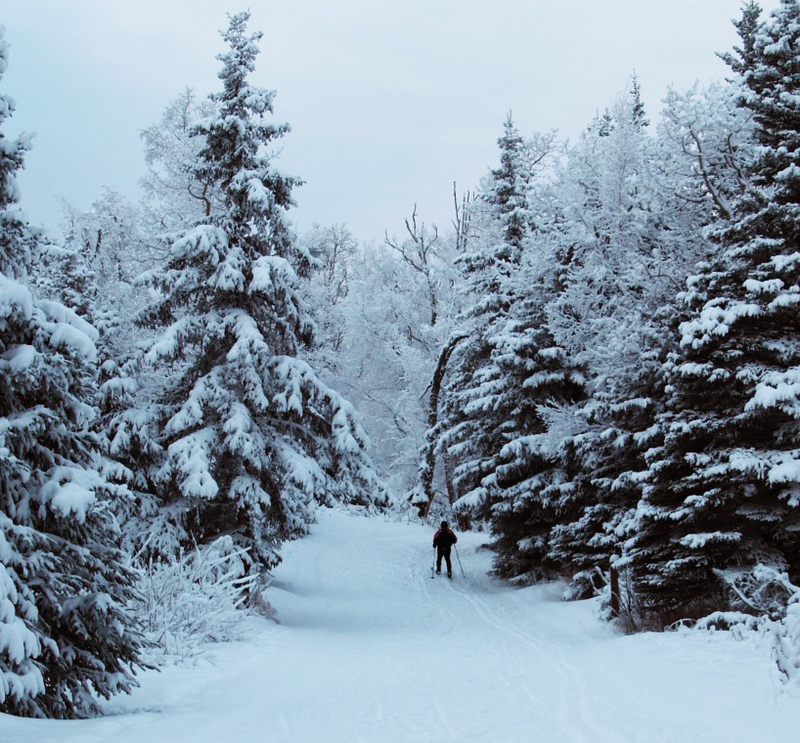 In the winter, the Birch Hill Ski Trails’ only use is skiing, as the grooming is provided entirely by the Nordic Ski Club of Fairbanks. This means you’ll never have to worry about footprints packing down the ski tracks or pets running rampant on the snow. Bear Lake Winter Trail circles Bear Lake and offers pristine views of spruce trees and mountains for skiers making their way across the five-mile trail. If you’re vacationing in Alaska, renting gear is the way to go. Anchorage and Fairbanks both have REI stores, which rent out Nordic skiing equipment. If you’re an REI member you can get classic cross-country skis for $19 per day with a charge of $8 for each additional day and skate skis for $23 per day with a charge $11 each additional day. All rentals come with ski poles and boots. Looking for more ways to ski in Alaska? Try out a race! You don’t have to be performing at an Olympic level to have a great time participating in races such as the Oosik Classic in Talkeetna or the Wednesday Night Race Series in Fairbanks. These races welcome skiers of all skill levels and are a wonderful way to enjoy the beauty of the Alaska outdoors while staying active.